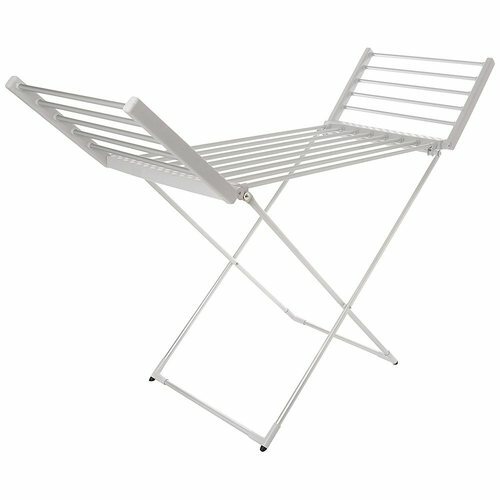 This 18 Bar Economical drying clothes horse is a safe and efficient appliance for drying clothes & towels. Ideal for use in the winter months or for homes without outdoor access, this winged airer costs as little as 4p per hour to run, supporting up to 15 kilos on its lightweight 2.5kg frame. Constructed from lightweight aluminum framing, this dryer is rust-proof, and easily folds away when not in use, making it the ideal solution for small apartments or university halls where a full drier is not viable or available. Please note: This product is not intended for use in bathrooms, and is rated IP22. Steam & spills may cause damage to internal components and void any manufacturer warranty included. Brilliant clothes airer saves lot of drying time cheap to run and folds up to save on space. Super fast delivery. Good product. Speeds up drying time. Would recpmmend.